Food waste is an untapped energy source that mostly ends up rotting in landfills, thereby releasing greenhouse gases into the atmosphere. Food waste is difficult to treat or recycle since it contains high levels of sodium salt and moisture, and is mixed with other waste during collection. Major generators of food wastes include hotels, restaurants, supermarkets, residential blocks, cafeterias, airline caterers, food processing industries, etc. In United States, food waste is the third largest waste stream after paper and yard waste. Around 13 percent of the total municipal solid waste generated in the country is contributed by food scraps. According to USEPA, more than 35 million tons of food waste are thrown away into landfills or incinerators each year, which is around 40 percent of all food consumed in the country. As far as United Kingdom is concerned, households throw away around 8 million tons of food each year. These statistics are an indication of tremendous amount of food waste generated all over the world. Anaerobic digestion (AD): A treatment that breaks down biodegradable waste in the absence of oxygen, producing a renewable energy (biogas) that can be used to generate electricity and heat. Currently, only about 3 percent of food waste is recycled throughout U.S., mainly through composting. Composting provides an alternative to landfill disposal of food waste, however it requires large areas of land, produces volatile organic compounds and consumes energy. Consequently, there is an urgent need to explore better recycling alternatives. Anaerobic digestion has been successfully used in several European and Asian countries to stabilize food wastes, and to provide beneficial end-products. Sweden, Austria, Denmark, Germany and England have led the way in developing new advanced biogas technologies and setting up new projects for conversion of food waste into energy. 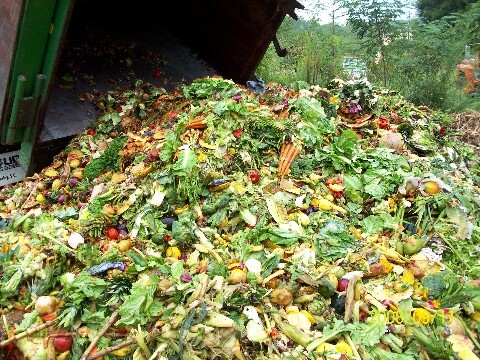 Of the different types of organic wastes available, food waste holds the highest potential in terms of economic exploitation as it contains high amount of carbon and can be efficiently converted into biogas and organic fertilizer. Food waste can either be used as a single substrate in a biogas plant, or can be co-digested with organic wastes like cow manure, poultry litter, sewage, crop residues, abattoir wastes, etc. Food waste is one of the single largest constituent of municipal solid waste stream. Diversion of food waste from landfills can provide significant contribution towards climate change mitigation, apart from generating revenues and creating employment opportunities. Rising energy prices and increasing environmental pollution makes it more important to harness renewable energy from food wastes. Anaerobic digestion technology is widely available worldwide and successful projects are already in place in several European as well as Asian countries which makes it imperative on waste generators and environmental agencies in USA to strive for a sustainable food waste management system.